The area that is generally referred to as Rancho Peñasquitos actually comprises two communities for City of San Diego planning purposes: Rancho Peñasquitos and Torrey Highlands. Because the two communities share a Zip code, locals tend to refer to both as Ranch Peñasquitos. Originally called “Peñasquitos East,” the planning area of Rancho Peñasquitos is located west of Interstate 15, north of Los Peñasquitos Canyon Preserve, south of the community of Rancho Bernardo, and east of the Torrey Highlands Community. State Route 56 traverses east-west through the central portion of the community. 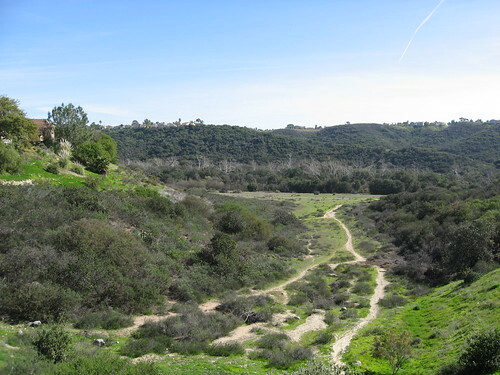 Rancho Peñasquitos encompasses approximately 6,500 acres including Black Mountain Regional Park. Approximately 51 percent of Rancho Peñasquitos is designated for residential development, 34 percent for parks and open space, and two percent for commercial. The community has a diverse topography that is characterized by numerous canyons, hillsides and ridges. The most prominent feature of the community is Black Mountain which rises to an elevation of 1,500 feet. Because of the many canyons and hillsides, most streets were designed in curvilinear fashion or with cul-de-sacs, many offering open space views. Because development of Rancho Penasquitos dates back to the 1970s, homes here are generally not subject to Mello Roos fees, and single-family homes are not subject to Homeowners’ Association fees. The newer community of Torrey Highlands is located in an area of the City still referred to as the North City Future Urbanizing Area. Torrey Highlands encompasses 1,134 acres and is west of Rancho Peñasquitos, south of Black Mountain Ranch, east of Pacific Highlands Ranch, and north of Del Mar Mesa. State Route 56 also traverses the community. The North City Future Urbanizing Area (NCFUA) is a 12,000-acre area stretching easterly from Interstate 5 (1-5) and Carmel Valley to the Rancho Peñasquitos and Rancho Bernardo communities. The NCFUA Framework Plan, adopted in October 1992, established five subareas or "neighborhoods.” Torrey Highlands is the area that was once referred to as Neighborhood IV. Because development of Torrey Highlands began in the 1990s, homes are subject to both Mello Roos Homeowners’ association fees. This newer planned community offers a balance of single- and multi-family homes, parks and services. Children generally attend schools in the acclaimed Poway Unified School District. The exception is a small enclave of homes at the southeast edge of the Rancho Penasquitos Community which fall within the boundaries of the San Diego Unified School District. Residents are subject to Proposition BB, which assesses each homeowner annually ($17.75 per $100,000 of assessed value) for the Palomar Pomerado health care system, and residents of within the Poway Unified School District are also subject to Proposition U benefiting the schools ($55 per $100,000 of assessed value annually).